An online slot with the beautiful game as it’s theme is always welcome, even if it’s graphically slightly basic as in the case of this chirpy game from Eyecon; it’s called Cup Carnaval and the title suggests we’re focusing on the more South American aspects of footie. Free spins are the extra features here so read on for more information. 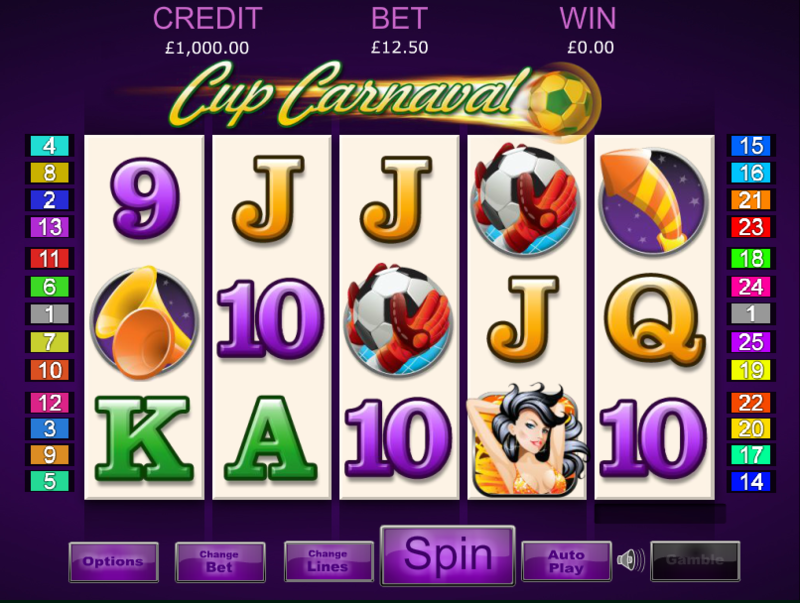 Cup Carnaval is a five reel slot with three rows and up to twenty five paylines; the design is simple and colourful with the white reels spinning against a purple backdrop while a green and gold ball zooms through the air at the top of the screen. The four higher value symbols are related to the theme and include a celebratory rocket, some air horns, a football boot and the ball in the safe hands of a goalkeeper; 9, 10, J, Q, K and A represent the lower values. The green and gold ball is wild, it appears on reels one, three and five and will substitute for all others to form winning combos except for the dancer scatter icon; it will also triple any wins to which it contributes. Any wild symbols landing during this round will expand to fill all positions on their reel if a winning combo is possible; more spins can be triggered by landing three scatters within this feature a maximum of fifteen times. Each win can be gambled by clicking the ‘Gamble’ button below the reels; you can now play a double up game by correctly picking the red or black symbols on offer; there’s a win limit of £32k or five correct guesses. Frankly there are better football-themed slots available but if you’d like to complete the collection then why not give it a go even if only for the gyrating dancer when she creates a win; the RTP is 94.90%.